Leslie Hendricks, 27, and her father, Levi Hendricks Sr., 53, hold their dogs they rescued from the rubble of their house in Moore, Okla., on Tuesday. 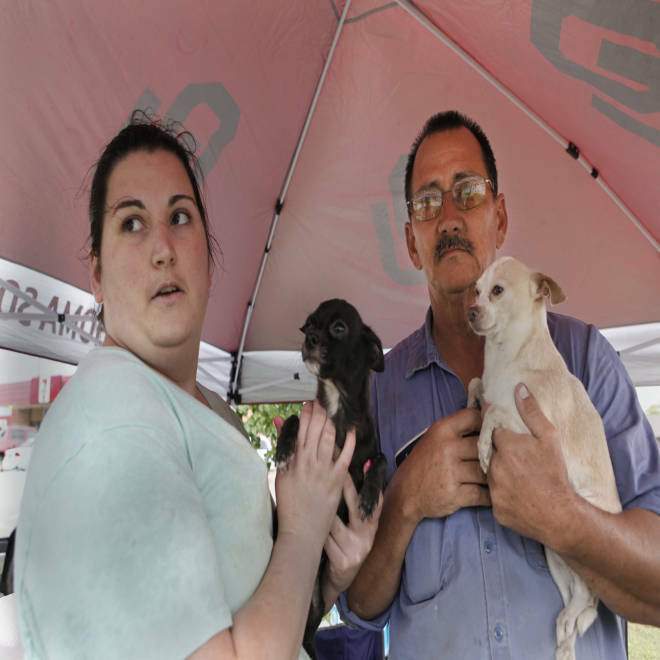 MOORE, Okla. – In the rubble of their flattened home, under a car and in a smashed kennel, were the two remaining members of the Hendricks' family: a pair of chihuahuas, Lola and Louie, who survived the monster tornado that struck this Oklahoma town. Levi, his wife Alice and two of their adult children rushed to their home early Tuesday to this tornado-torn corner of Moore to find their beloved dogs. Cadaver dogs checking their neighbor's house swooped into help. The Hendricks had found Wiley, their doberman, and Gaby, their boxer, in the backyard earlier. They were under a pile of debris, nestled under the apparent shelter of a picnic table. “They come out with not a scratch … they were perfectly protected,” Levi said. But the chihuahuas were stuck inside the house when the killer twister roared through Moore. Lola and Louie were trapped. 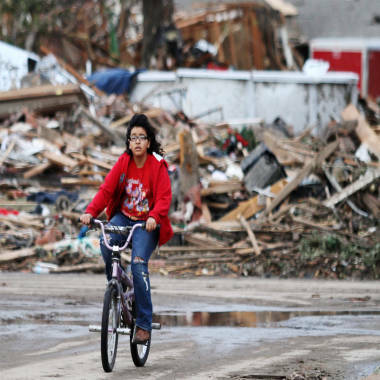 A monster tornado hit Moore, Okla., Monday afternoon, leaving at least 24 people dead as the threat of further storms continues. “They could hear whining and that's how we pinpointed where they were at and started digging at that point,” Levi said, at times wiping at tears. Levi and his two sons began digging through the rubble to get the beloved pets out. But on the inside, the animals – Louie, a white-fur 3-year-old, and Lola, a black-fur 2-year-old – were just fine. “They could smell him and hear him,” he said of the cadaver dogs as he cuddled Louie, who shivered and chowed on a breakfast burrito that one of Levi's sons, Levi III, fed him. “I've got to say God put his hand out and covered both of them,” the elder Levi said as he broke down. The couple, who had lived in the home for six years, were at work when the tornado struck. They said their granddaughter, a student at Plaza Towers elementary, where seven children died in the tornado on Monday, also emerged unscathed from the debris, with some scratches on her feet and gravel in her hair. They may be able to salvage some items from the garage, but everything else was gone.